Last spring I had the chance to taste the German and Austrian portfolios of one of my favorite importers Savio Soares in Brooklyn. As we tasted I was impressed by the selection of unusual styles and grapes not often seen in the mainstream, these where really very special wines made with passion and attention to detail. Savio explained he searches for wines from very small estates that show the true expression of their individual terroir often run by just members of the immediate family with no fancy tasting rooms or lavish trimmings. 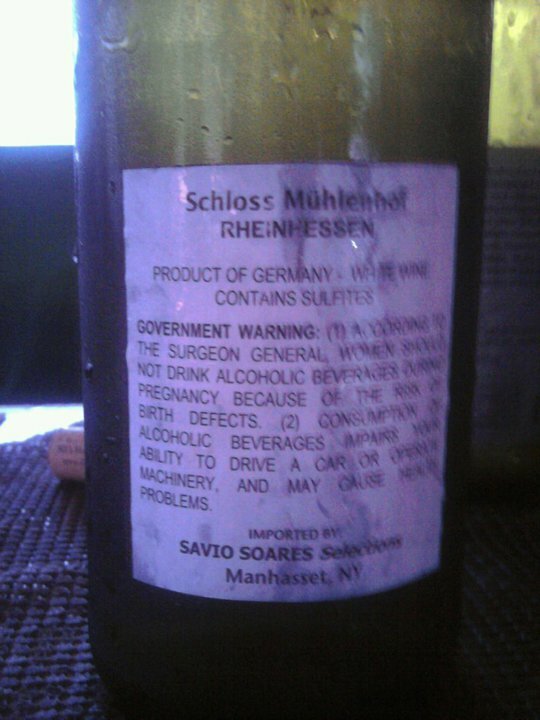 Schloß Mühlenhof Müller-Thurgau trocken 2009 from Rheinhessen, Germany (the largest of Germany’s 13 regions) is one of my favorite wines from Savio’s selections. Müller-Thurgau is a grape created by Dr. Herman Müller hailing from the town of Thurgau in the late 1800’s. For many years it was thought to be a crossing of Riesling and Sylvaner but recent DNA profiling has found that Madeleine Royal (aka Gutedel) not Sylvaner is the other grape used in the crossing. Schloß Mühlenhof founded in 1846 now in it’s 6th generation of family vintners is currently being farmed by Gabriele, Nicolas and Walter Michel. They are practicing organic in the vineyards but not certified, a green harvest is done in early August each year cutting up to 1/2 of their fruit to impart the best flavors and fruity expression of Rheinhessen into the remaining grapes. Done in a dry or trocken style this delicious wine is full of ripe apricot, juicy peach and orange blossom flavors with a lingering finish. Aging on the lees for 5-7 months in stainless steel imparts a richness and slightly creamy mouthfeel. I paired it with a 2 yr. old Boerenkaas Gouda, ginger mango chutney and some brown bread but many say the perfect pairing for Müller-Thurgau is fried chicken. Whatever your pairing preferance grab yourself a bottle of this and enjoy. For under $15 it’s one of the best values of summer.